Summary: The Flash returns with an impressively well-structured and unendingly fun episode, dialing back the drama for an old-fashioned comic book villain team-up. 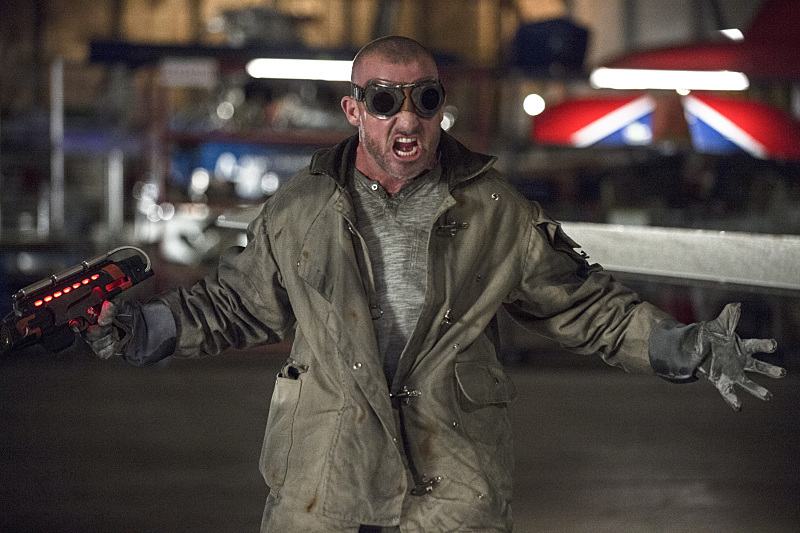 Leonard Snart/Captain Cold returns to Central City with a new hotheaded partner in tow – Mick Rory/Heat Wave. The duo plan to steal a multi-million dollar painting, but Cold has another agenda while in town – to set a trap for The Flash. 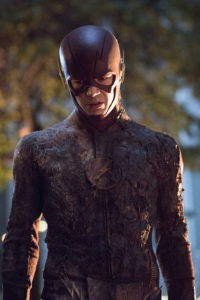 Barry, who has been doubling his training effort for when he inevitably faces Reverse-Flash again, decides to ignore Snart due to the immense destruction of their last battle. Cisco provides the CCPD a new shield to confront Cold themselves. Joe disagrees with Barry’s decision, believing Barry is being swayed away from his duties as a hero by Dr. Wells. Caitlin investigates the word “Firestorm” that Ronnie said in their last meeting, and discovers it’s an acronym for a project involving transmutation and splitting atoms, and a scientist involved named Martin Stein has disappeared. 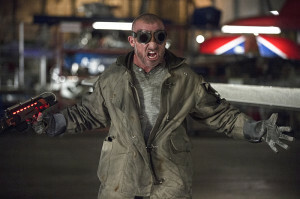 After Flash doesn’t respond to their traps, Cold and Heat Wave kidnap Caitlin and threaten to kill her unless The Flash shows up for a battle of fire and ice. With help from Wells and Eddie, Flash is able to stop the two villains by crossing the beams from their fire and ice guns. 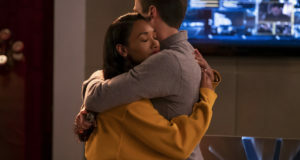 Meanwhile, Iris and Barry confront the awkwardness in the aftermath of Barry’s confession; Barry helps her move in with Eddie and promises that they will be okay, and that he is okay with she and Eddie together. Barry decides to move back into the West house in Iris’s empty room. In police transport, and Captain Cold and Heat Wave are rescued by Cold’s sister. One of the key trials for any semi-serialized “mytharc” show is how to fit in episodes not dealing with the main A-plot of the season. When the Big Bad is running around, it’s hard to justify why the hero would be pursing anything but the most dangerous bad guy. “Revenge of the Rogues” uses this concept as its core, and posits this question right at the forefront. 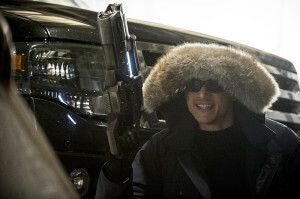 The Reverse-Flash was such a good nemesis that the returning Captain Cold pales in comparison, so why would Barry move on from the danger established in the midseason finale? After all, we only consider a villain-of-the-week the primary one at the time because the episode focuses on him/her; plenty of other villains are constantly in the background, plotting and doing minor misdeeds. So if Barry never confronts the potential bad guy, that doesn’t make him a major bad guy, right? It’s a fun, somewhat meta twist on the “if a tree falls in the forest” adage, because it assumes the villain is only a real threat if the hero is going after him. The episode’s singular answer to these questions is that the lines can’t be so clearly drawn. There are numerous examples of split dichotomies and focuses — Heatwave and Captain Cold are completely different powersets and personalities; Wells and Joe are opposite kinds of mentors; Reverse-Flash and the current Rogues are staying hidden and trying to get attention, respectively. Things fall apart when these dichotomies are kept totally separate, and Flash only succeeds when — on-point Ghostbusters reference aside — he crosses the streams, both literally and metaphorically. The training for facing Reverse-Flash can be helpful for other situations, and both the logic of Dr. Wells and the empathetic need to save people of Joe together are what makes Barry succeed as Flash. 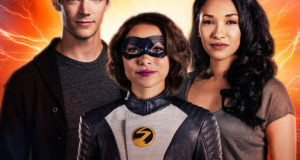 You could even extend this concept to other elements like Eddie, who saves Flash despite his anti-Flash instincts, erasing the hero/villain line he’d drawn back in “Flash vs. Arrow.” Or that Barry and Iris recognize that they can blur the line a bit between best friends and unrequited love, if it helps save their friendship. Prison Break alums Wentworth Miller and Dominic Purcell as Leonard Snart/Captain Cold and Mick Rory/Heat Wave, respectively, fit into this dichotomy theme almost to a fault. As good as Miller was on his own as the calculating Snart in his first appearance, the two playing off each other yields the most comic book-y villians in the DCwU so far. Frankly, the two of them would fit in just as well in the cheesier villains of the classic The Flash series. Yet, while the puns are generally nothing but cringe-worthy, it’s hard to criticize any of it. It’s completely purposeful, for one, intentionally invoking the cheese associated with classic superhero comics. The characters are quick to comment on the weirder world they’ve found themselves in, like Wells realizing he says “catch cold,” or Miller’s hilarious deadpan delivery of “That’s funny” to Joe calling Heatwave a hothead. It also helps to ease into the lighter fare; “The Man in the Yellow Suit” wasn’t necessarily a dark episode, but it carried heavier concepts than most episodes do, and two threatening-but-funny villains brings the drama back down a notch, even if only slightly. Miller and Purcell are clearly having a blast together, and that only adds to the high energy of their scenes, even when little is actually happening. They probably wouldn’t fit on any other show like this, and it’s a testament to The Flash‘s uniqueness. The surrounding elements are also The Flash bringing its A-Game. 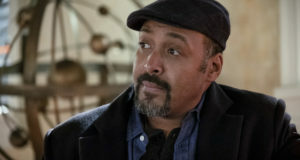 The show struck gold with Jesse L. Martin and Tom Cavanaugh, and that the budding rivalry between the two means we’ll be getting more and bigger scenes with the two of them is a huge plus. While this isn’t the teen/young adult drama that Smallville was, The Flash has used Barry’s youth as a reason to mirror the family/parental material that worked in the former show in the early years. It’s an unexpected move, with Joe becoming a much more central character than expected, and this oncoming war of the father figures has potential for great drama. While Barry moving back in with Joe is a supremely sweet development — more teary-eyed huggy moments between Joe and Barry is certainly welcome! — it also digs Barry further into being under the wing of two very different mentors. Barry himself is more confident than ever this week, changed but not damaged by the pivotal confrontation with the Reverse-Flash. Grant Gustin gets to be a lot less awkward, as the increasingly headstrong Barry confronts problems more directly than he had before. In particular, the Iris situation moves along, with Barry doing his best to put her at ease that he is okay with her relationship with Eddie. The worry here is what Iris will contribute to the show now that her primary arcs are wrapped. Barry’s feelings are exposed, she’s out of Joe’s house, and she’s currently ceased the Flash support, but at the same time, the path of the rest of the season in general is wildly uncertain. On the side is Caitlin’s investigation into Ronnie and Firestorm — or rather, F.I.R.E.S.T.O.R.M. While the development is slow burn here — we learn the mouthful of an acronym for a project about transmutation, and it may be involved in a conspiracy with a missing scientist — it’s just as promising as anything else, a solo story for Caitlin to pursue that could easily spread into a major storyline. And three Firestorms are impressively met or mentioned in this episode (Ronnie Raymond, Martin Stein, and Jason Rusch) before Caitlin is kidnapped, so things are certainly getting accomplished. “Revenge of the Rogues” is an impeccably well-structured hour, one that picks up all the plot points from the finale and furthers them with ease. Moreover, it’s a good example of how well this show was conceived. Its characters and elements were so elegantly set-up from the start that even a rather filler-y episode is heavy with engaging and thematically interlocking subplots. As with every episode of the show, it’s just a helluva lot of fun, and even the silliest, most over-the-top elements work within the scope. And even if they don’t, they’re forgivable because the rest of the show is and continues to be just so damn competent. I had my qualms with Cisco early in the series, but he’s been coming into his own since around “The Brave and the Bold.” Absolutely love his interactions with the cops and the cold-shields STAR Labs creates. What was with Iris awkwardly showing up to the big battle? Did they so badly need someone to be yelling for Eddie when he ran into the fight? Of course Captain Cold kidnaps Caitlin Snow, who in the comics is Killer Frost. This episode is brilliant in its silliness. It’s hard to pin down exactly why, but Joe seems more like an actual dad than a whole lot of TV dads. Jesse L. Martin does a fantastic job capturing every morsel of emotion he can. And there are moments like where he admits to taking away Iris’s stuffed animal because she broke his Duke Ellington: Live at the Blue Note vinyl. Actually, lots of banter between Joe, Iris, and Barry this week is great, and Martin’s material even feels ad-libbed a lot of the time. Really! What millionaires would carry a “$25m” painting in their jet WITHOUT AT LEAST BUBBLE WRAP???? HA! That’s hilarious. I hadn’t even thought of that. I didn’t see it pointed out but Iris’ favorite toy growing up was McSnurtle the Turtle.